The beginnings of the Jewish population in Mexico dates back to 1521. Many Jews fled Spain to escape the Inquisition. In 1800, a number of German Jews came to Mexico to escape the pogroms in Russia and Eastern Europe. A second large wave of immigration occurred as the Ottoman Empire collapsed, leading many Sephardic Jews from Turkey, Morocco, and parts of France. Finally, a wave of immigrants fled Nazi persecution during World War II. 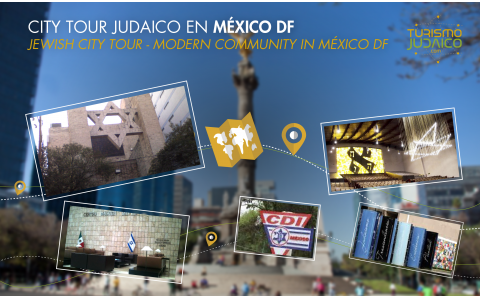 Today, there are over 50,000 Jews in Mexico, the third largest Jewish community in Latin America, mostly concentrated in Mexico City. Within other communities in the state of Jalisco, mainly in Guadalajara, and in Monterrey, Veracru, Cancún, and Tijuana. In 1938 the Jewish Central Committee of Mexico emerged as the umbrella organization for centralizing ethnic and religious Jewish communities in Mexico. Mexico, has an area of ​​1,964,375 km with a length of their continental coasts of 11,122 km. In Mexico lives more than 107 million people, making it the most populous Spanish-speaking nation. Politically, it is a democratic, representative and federal republic. The country consists in 32 states. The seat of government and the powers of the Mexican Union is Mexico City, D. F., whose territory has been designated as a federal district. The Spanish lives in Mexico with numerous indigenous languages ​​officially recognized as citizens by the Mexican State. Mexico is also one of the countries with the greatest diversity of climate in the world. Spread over its territorial sea numerous islands, which together have a combined area of 5,073 km. Mexico is the only country that contains two gulfs on two oceans, from the Gulf of California, also known as the Sea of Cortez in the Pacific Ocean and Gulf of Mexico to the Atlantic Ocean. The relief is characterized by very rugged and host multiple volcanoes.